Ideas, information, cocktail recipes, and entertaining tips for amateur mixologists and those who like shaking and pouring their own cocktails. I just love cocktails! One of my hobbies is creating new cocktails. I have enjoyed drinking cocktails since my early twenties, when I developed an unfortunate taste for Zombies and Singapore Slings, but I later drifted away from heavy consumption of these drinks in the interest of my health, concentrating instead on more pedestrian drinks like Rum and Coke (always with lime) and beer and wine. Languorous vacations in Hawaii gave me a taste for the ubiquitous Mai Tais and Pina Coladas, which were easy to mix in my vacation condo (and when I got back home). After a few good martinis one evening, and one thing leading to another, I started stirring and shaking my own craft cocktails. 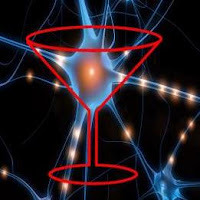 Visit my latest project, The World Cocktail Brain, now hosted at WebBrain.com. The WCB is a new way to expand your cocktail knowledge, discover new recipes, find cocktail facts and more in a dynamic, new viewing environment. It may take a few seconds to load, but it's worth waiting for! Click on this link to open The World Cocktail Brain in new tab/window. Click on this link to open My Blog Roll embedded in The World Cocktail Brain. The Negroni was named after Count Camillo Negroni of Firenze, who ordered the same cocktail every day. Legend has it that one day Negroni was looking for something a little stronger than the ubiquitous Americano, his favorite aperitivo, and that bartender Fosco Scarselli at Caffè Casoni replaced the standard soda water in the Americano with Gin… a man after my own heart. The new drink became so popular that Negroni’s family began bottling and selling it. The sweet Vermouth offsets some of the bitterness of the Campari®, and the gin cuts the flavor some more, resulting in a very desirable cocktail. Campari (CS# 064636) is in general distribution in Utah, but if your local State Liquor Store is small, you might want to make sure they have it in stock before you make a special trip. If you are interested in trying a sweet Vermouth a little better than the ubiquitous Martini & Rossi® Rosso, you should try the Quady Vya (CS# 910764), but it is in limited distribution so be sure to call ahead. Combine ingredients in a mixing glass half full of cracked ice. Stir briskly until nice and cold. Strain into a pre-chilled cocktail glass. Garnish with twist of orange peel, burnt if you want to be really authentic.